Paper plate wreaths are a great addition to Christmas decors, as they are easily placed on walls and doors. 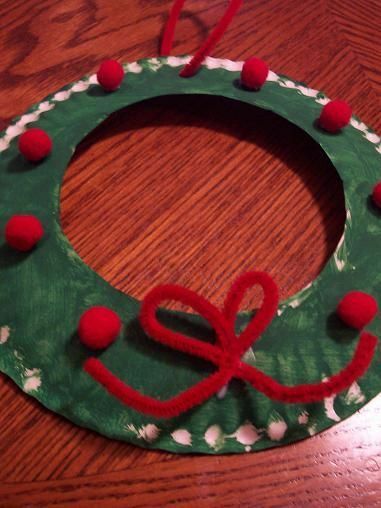 These wreaths made by cutting out the middle part of the paper plate, and the surrounding part painted green. You can then adorn the wreath with red ribbons, white lace, or twisted red and white pipe cleaners. You can also stick fluffy red balls on the painted plate as well to add more texture. Another way to decorate the wreath is by adding a cut-out candle in the middle, or halved glittered acorns and handmade poinsettia flowers.